This wood oil is especially developed for wooden floors that are untreated or oil treated. The Pale Grey pigment paste has been offset with Floor Oil. A special sponge should be used in order to apply the best possible coat. The soil treatment protects the boards from grease, dirt and dryness. At the same time, it forms a certain protective film so that direct wear and tear of the boards is greatly minimized. Perform the initial grinding and treatment following with care in order to achieve the best result. The surface of your wood floor should be freshly sanded, at best, with fine grain sandpaper grain (100- 200) before applying the base oil. Only after that should this should the oil be applied with a special sponge. 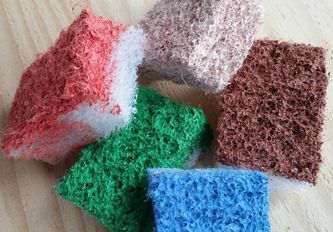 You can find the correct sponge needed in our Shop. After 20 minutes, up to one hour of exposure, should the excess oil be wiped off with a lint-free cloth. If necessary, this process can be repeated until the desired saturation coverage has been reached. For Guidance in the proper use of our oil Click Here.